The history of synthesis has already been written many times, and numerous books (some well researched but others much less so) purporting to tell the stories and evaluate the instruments that adorn them have been published over the past 30 years or so. Today, the situation has improved enormously; I recently reviewed a couple of books that proved to be both meticulously researched and cracking good reads. Now it’s time for the video world to catch up. There are a handful of gems out there, but many of the broadcast documentaries lack understanding of the subject matter and perpetuate every irritating stereotype the writers could employ. Clearly, there’s a need for an oral history told by the people who were there at the time, and who are able to reminisce about the people, the companies, the arguments and the decisions that lay behind the published histories. 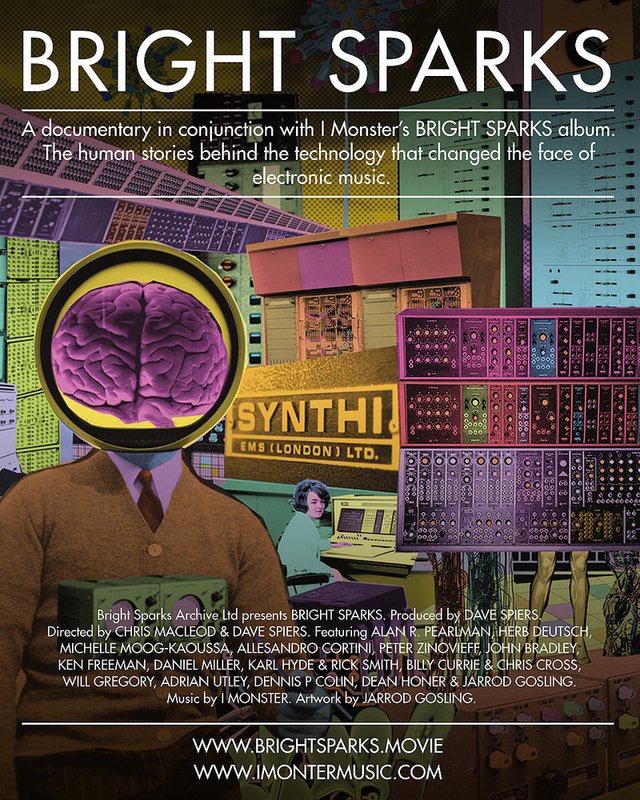 Strangely, Bright Sparks was originally conceived by Jarrod Gosling and Dean Honer of the band I Monster as an album that honoured specific synthesizers (or families of synths), by featuring them on individual tracks with lyrics telling their stories. They decided to focus on eight that they regarded as seminal: Moogs, Buchlas, ARPs, the Chamberlin and the Mellotron, the EMS VCS3, the EDP Wasp, and the Freeman String Symphonizer. But as they didn’t have all of the equipment necessary to make this a reality, they approached Dave Spiers and Chris Macleod of GForce to ask whether they could borrow some of the instruments that they needed — the chaps at GForce were happy to assist. One day, out of the blue, Honer asked Spiers whether he would be interested in making a short movie to accompany the album. Spiers agreed because, for reasons we need not discuss here, he’d realised that the time would come when the original pioneers were no longer with us, and the opportunity to hear their first-hand accounts would be lost. Not wanting to reduce the proposed interviews to soundbites, he suggested that, rather than make a promo video, they should attempt a cinematic-length documentary. Everyone agreed, so Spiers and Macleod spent a year travelling, interviewing and editing, often coming away from the sessions with fascinating accounts that illuminated the accepted histories. When filming was complete, the collaborators decided they’d release the album and the documentary simultaneously; a world premiere was screened in Reading, UK, late last year. Like the album, the movie is split into eight chapters, opening with an account of the birth of Moog synthesizers. This is fascinating because, when Herb Deutsch (who started working with Bob Moog in 1964) discusses their adoption of voltage control, the invention of the 1V/octave tuning standard, and the arguments over whether a synth should have a keyboard or not, he’s not discussing received history, he’s telling you about the actual discussions he and Bob had more than 50 years ago! Others chapters include: Alan Pearlman, who for decades had declined to be placed in the spotlight but here talks freely about the initially prickly relationship that he had with Moog; ARP engineer Dennis Colin who co-designed the ARP 2600; John Bradley of Streetly Electronics, who is much more forthright than most about the incidents leading to the birth of the Mellotron; a wonderfully candid Peter Zinovieff of EMS; Fred Gardner of EDP; and Ken Freeman explaining how he conceived the idea of the string synth. The result is a documentary that isn’t merely well informed, it’s definitive. And — with no silly camera angles, no stupid lighting, no intrusive background muzak, and no trendy (and unwatchable) shaky cameras — it’s a pleasure to watch, almost as if the interviewees are sitting in your own living room or studio. All of the music for the video and album was written and played by I Monster, with just a handful of additional performers. At this point, I have to declare an interest, because I played the Freeman String Symphonizer on the wonderfully titled, ‘The Further Adventures Of Ken Freeman & His Incredible Machine Of A Thousand Strings’. But all of the tracks deserve repeated listening because, as well as being damn good music, they often use the instruments in ways you may not expect. And how can you resist tracks called ‘The Wizards Of Putney Deny Accusations Of Unholy Enchantment At The Electronic Music Studios’ and ‘Alan R Pearlman & The ARPiological Exploration Of The Cosmos’? Bright Sparks isn’t just another tribute to analogue synths; it’s perhaps the most successful project yet to persuade the sometimes shy and always modest pioneers of the ‘60s and ‘70s to tell the human stories behind the electronics. As such, it’s warmly recommended to everyone who has an interest. Film £8. Film & album £15. Film £8.99 (about $13). Film & album £15.99 (about $23).